Because I am very busy over the next few days, and won’t have time to write a formal article this is the replacement. Me and Steve Wozniak in the Airport. Yesterday, I finally got to meet Woz (Steve Wozniak)! Having just arrived in Atlanta Hartsfield International Airport with my robotics Team 555, while waiting for our luggage to come up, I noticed Woz walk up and look at the TV that displayed the Baggage Claim listings. I quickly introduced myself and I asked if I could get a business card and a picture. He gladly gave me a business card and took a picture with me. 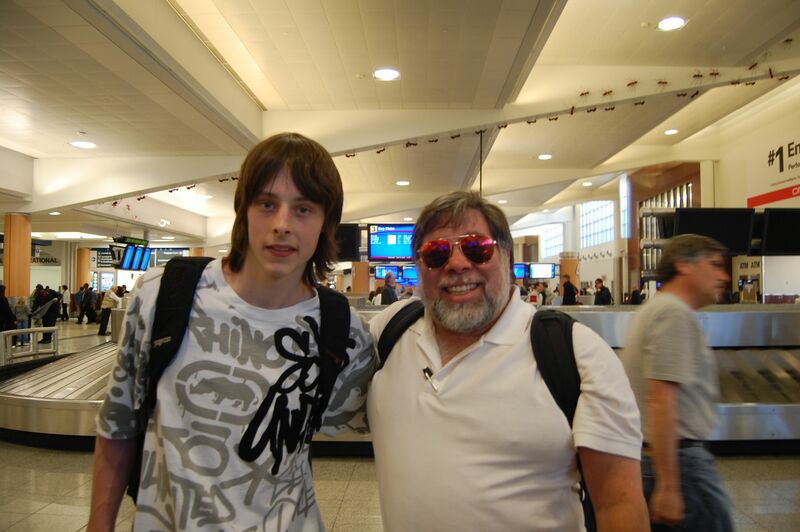 This wasn’t the first time I ran into Woz, however! Last year in Atlanta, at the FIRST Championship, where Woz regularly judges, I saw him riding a Segway and asked him for his business card- but he was all out. It is great to finally get the famed, laser engraved, business card and a picture! Thanks Woz! !